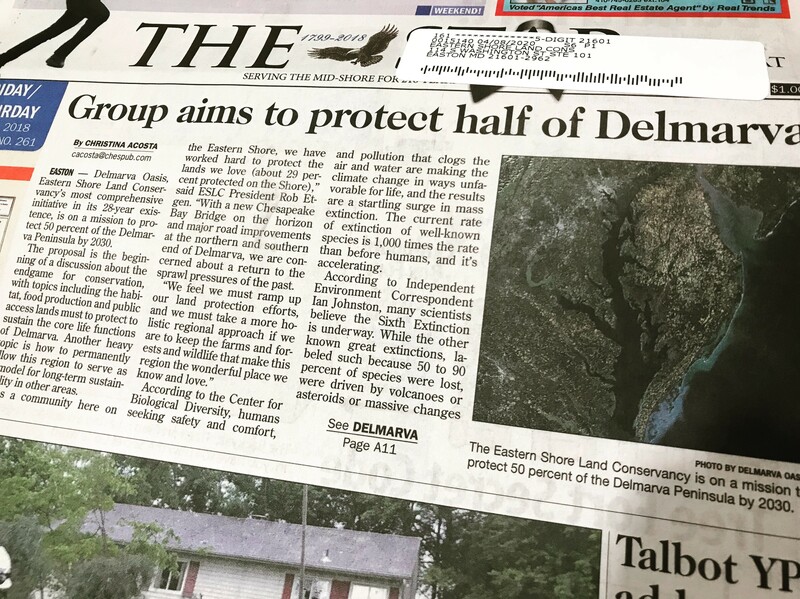 On Friday, July 27th The Star Democrat published an article on its front page about ESLC’s most ambitious initiative in its 28-year existence, currently referred to as Delmarva Oasis. The initiative, which seeks to include the support and partnership of multiple conservation-based organizations and the local governments of three states, is a beginning of a discussion about the end game for conservation. 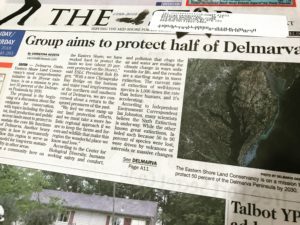 In other words, what habitat, food production and public access lands must we absolutely protect to sustain the core life functions of Delmarva – permanently, and can this region serve as a model for long term sustainability in other areas. According to such lead experts as renowned biologist and author, E. O. Wilson, the answer in large part lies in landscape-level land conservation. More conservation is needed, faster than before, and at scales unprecedented. Wilson proposes the idea in his 2016 book, Half Earth – Our Planet’s Fight for Life. Research shows that if we conserve half the land and sea globally, the bulk of biodiversity will be protected from extinction. More specifically, 50% conserved equals 85% of species entering the safe zone, and 85% of species saved equals a planet stabilized enough for humans to continue to exist. “As a community here on the Eastern Shore, we have worked hard to protect the lands we love (about 29 percent protected on the Shore),” said ESLC President Rob Etgen. “With a new Chesapeake Bay Bridge on the horizon and major road improvements at the northern and southern end of Delmarva, we are concerned about a return to the sprawl pressures of the past. A flight over or drive through Delmarva confirms vast acreages of highly productive farmland interspersed with working forests. In fact, here on the Delmarva exists the largest contiguous block of productive farmland on the East coast from Maine to the Carolinas. The Delmarva is a place of transitions: Virginia meets Delaware meets Maryland; Chesapeake and Delaware Bays meet Atlantic Ocean; north meets south; farms meet forests; land meets water again and again. Stretching nearly 200 miles north to south, the Delmarva Peninsula has been a dominant agricultural and maritime center on the East coast for centuries. For generations this Peninsula has been held separate from the bustling swell of cities around it, unreachable without huge investments in bridge spans and tunnels. From a travel and transport perspective within the growing Route 95 corridor, the Peninsula simply wasn’t a way to get anywhere – enabling the region’s natural richness to exist unmarred by overdevelopment. Open, natural land is the best long-term savings plan available to a rural region like the Delmarva. Not only is every dollar spent on conservation multiplied many-fold in the community, but protected lands ensure the economic services and success of the next generation. Without it, the Delmarva will quickly dissolve into just another no-name suburb of the Rt. 95 corridor.